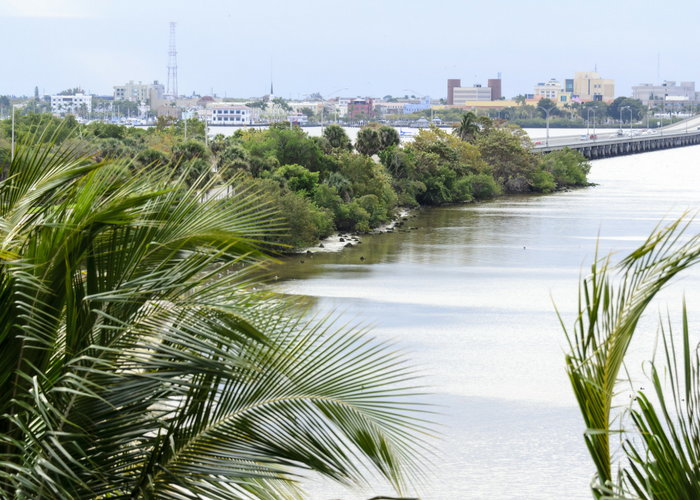 Take a cue from local college students, spring breakers, those traveling for sports tournaments, and families on a budget who have already discovered these clean, cozy and cheap hotels in Fort Myers. 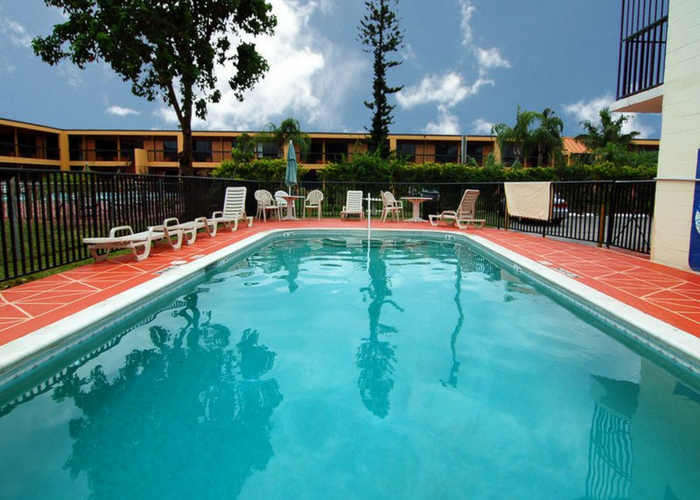 Choose your Fort Myers motel wisely and you won’t even have to sacrifice extras like free Wi-Fi and complimentary breakfast. Here are 10 dependable cheap hotels to consider if you’re on a budget for your Florida vacation. 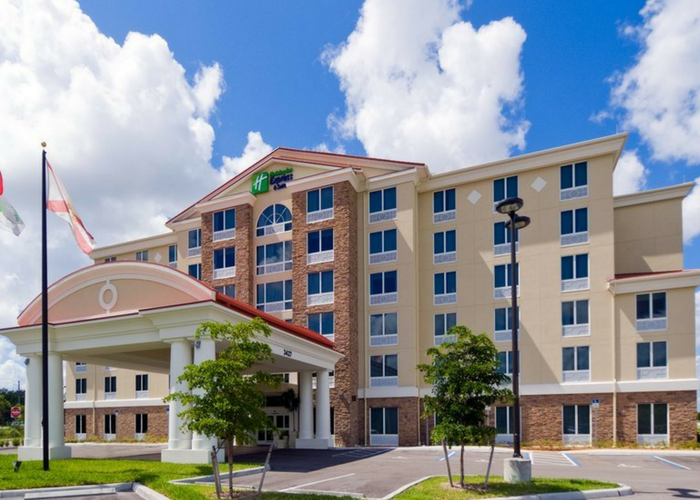 With its choice location in the historic Downtown River District, this colorful, value-driven facility (also known as the Holiday Inn Fort Myers – Downtown Area), shouts Southwest Florida. A shimmering, tropically landscaped pool is a highlight, as is the location: As the name indicates, it’s so close to the Edison-Ford Estates that you can walk there. Renovated in 2015, the hotel features upgraded, comfortable bedding and furniture. All rooms have flat-screen TVs and micro-refrigerators; there’s even a private-access floor for those business travelers seeking quiet. This clean, contemporary roadside motel is a real find. It overlooks the Caloosahatchee River, which offers stunning views of wildlife and sunsets alike. Done in shades of blue, gray, and silver, there’s an obvious effort made at design, with an Art Deco curvilinear sign outside advertising the space as the “Riverview Boutique Inn & Suites.” Inside, the compact rooms make great use of space with everything racked on the walls, including a flat-screen TV and an iron and ironing board. Friendly staff fronts the desk 24 hours. Most of Fort Myers main attractions—the River District, Centennial Park, and performing and visual arts venues—are less than two miles away, and plenty of restaurants and bars are within walking distance. Amenities: Flat-screen TVs, iron/ironing board, and river view. 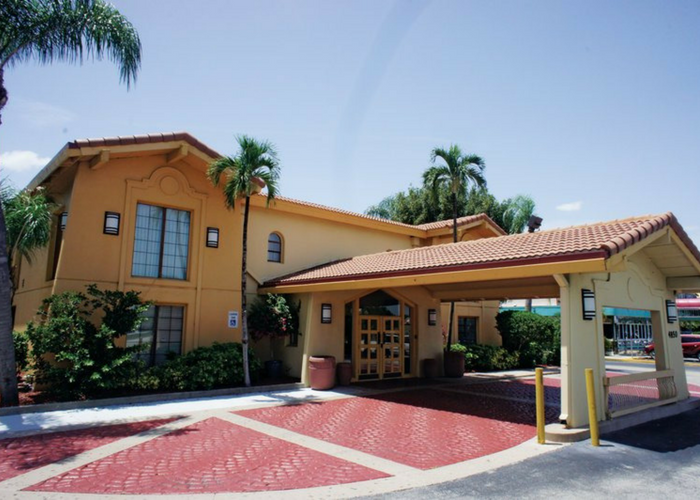 Though travelers usually think of cheap lodgings as free of frills, Fort Myers’ Econo Lodge North does have a few extras, including complimentary Wi-Fi, free parking, and breakfast included daily. There’s also a business center and an outdoor pool. The location is central as well: The Harborside Event Center, the Franklin Shops, the Art of the Olympians Museum and the River District are all under two miles away. And multiple North Fort Myers restaurants and recommended businesses are in the immediate area. Amenities: Free Wi-Fi, free parking, breakfast included, business center, and outdoor pool. 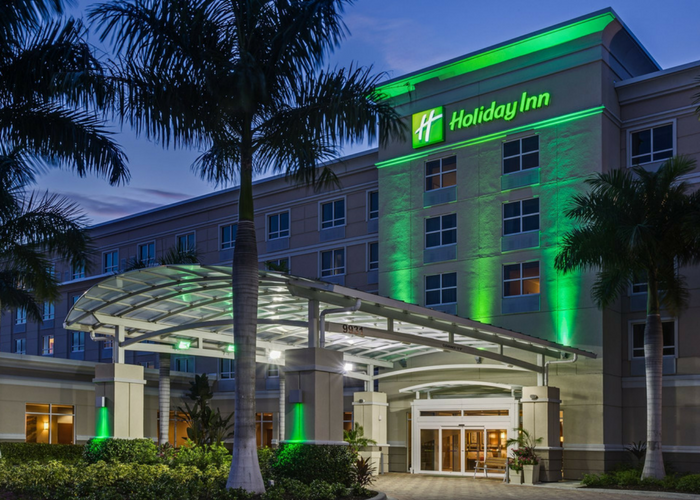 Although not as inexpensive as other cheap hotels in Fort Myers, this new Holiday Inn delivers great overall value. Shuttle transportation to and from the main airport, only three miles away, is available. Clean, neat rooms and suites feature microwaves, mini-refrigerators and coffeemakers, as well as flat-screen LCD TVs with cable television, plus bathrooms with hand-held European-style showers. Outside, a fire pit overlooks a lake; there’s also a landscaped indoor/outdoor “Oasis” pool and hot tub. Amenities: Free Wi-Fi; breakfast included; free parking; air conditioning; in-room microwaves, coffeemakers and mini-refrigerators, flat-screen LCD TVs with cable; hand-held European-style showers; indoor/outdoor pool; hot tub; fitness center; self-serve laundry services; dry cleaning services; multilingual staff; restaurant/bar; room service; live entertainment; fire pit; shuttle bus; and airport transportation. More inexpensive than cheap, these large, clean and comfortable rooms—recently renovated—are great for families. The in-room microwave and refrigerator offer a budget-friendly alternative to eating every meal at a restaurant. Don’t worry about breakfast, though—it’s complimentary. 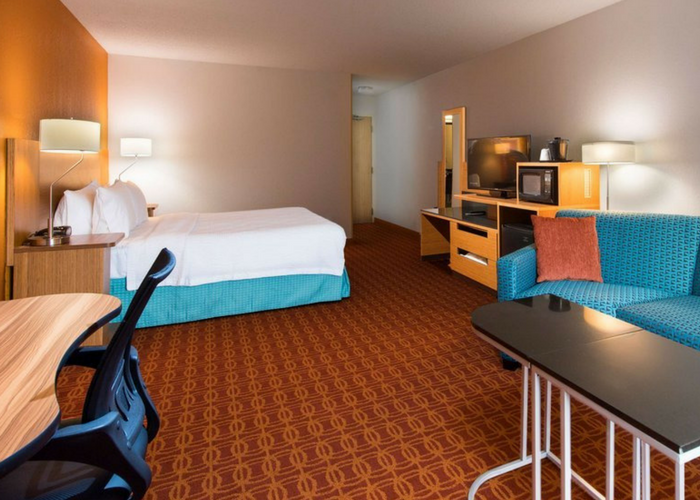 With its central location, this hotel makes it easy to attend the Minnesota Twins and Boston Red Sox spring training baseball games, stroll through the Bell Tower Shops, take in the wildlife refuges and preserves, or see a show at night at the Barbara B. Mann Performing Arts Hall. Amenities: Pool, free parking, free Wi-Fi, fitness center, breakfast included, laundry service, self-service laundry, dry cleaning, multilingual staff, air conditioning, and in-room microwave and refrigerator. These quirky cottages—a total of 36 units—were built in the 1940s by architect James Morre, who constructed them around a lake. Don’t worry—the resort has been renovated since its historic beginnings, with all units featuring new furniture and BeautyRest mattresses. Many of the unites even include kitchens. The cottages have covered porches that face the lake. 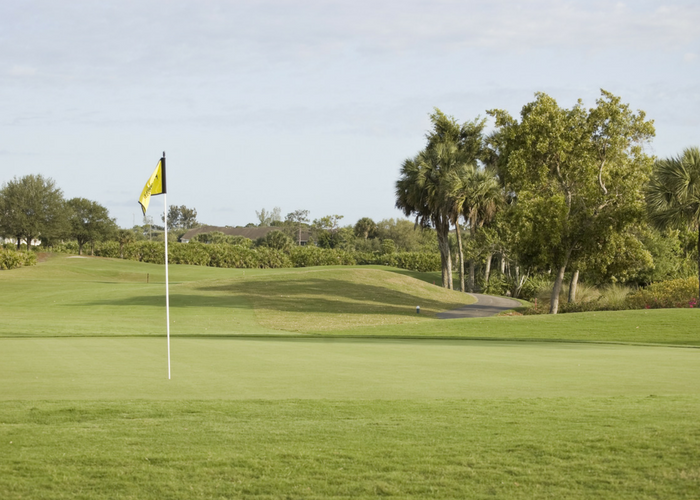 Billy Creek, which feeds right into the Caloosahatchee River, runs behind the resort, and there are plenty of places around the property to take a nature walk or play horsehoes or ping-pong. 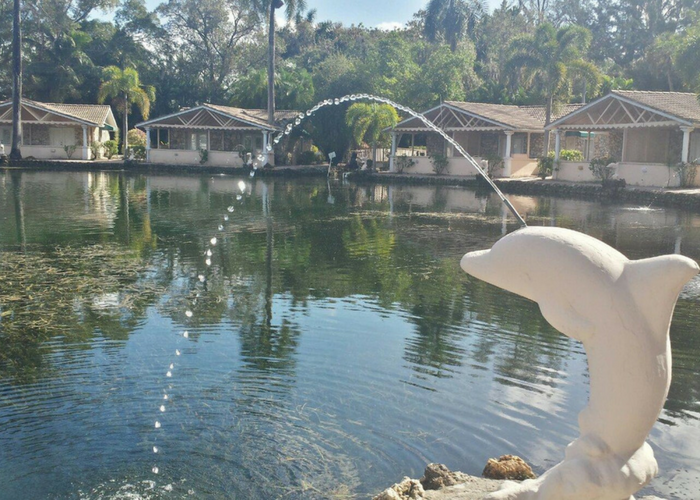 Amenities: Free Wi-Fi, heated pool, nature walk, canoeing/kayaking Billy’s Creek, fishing, kitchens in 19 units, access to Caloosahatchee River, horseshoes, and ping-pong. Upgraded digs and professional staff have made this Holiday Inn a pleasure to visit. Comfort, convenience, and value are the primary goals here: The business center, conference facilities and meeting rooms are available for use; breakfast is included daily; and a microwave and refrigerator are included in each room. Amenities: Free Wi-Fi, breakfast included, free parking, flat-screen TVs, air conditioning, in-room microwaves and refrigerators, business center, meeting rooms, banquet room, conference facilities, heated outdoor pool, fitness center, self-service laundry services, dry cleaning, and multilingual staff. Situated just east of the Caloosahatchee River on US41, the city’s main drag, this Southwestern-motif hotel highlights value, location, and amenities as its main attractions. Rooms come equipped with a coffee/tea maker, iron and ironing board, and flat-screen HDTV with more than 30 channels (as well as plug-and-play options to connect your own technology). Other perks include the chain’s free daily Bright Side Breakfast, a heated outdoor pool, and a tennis court. Amenities: Free Wi-Fi, breakfast included, free parking, heated outdoor pool, dry cleaning, laundry service, self-serve laundry, meeting rooms, concierge, multilingual staff, tennis court, HDTV, coffee maker, and iron/ironing board. 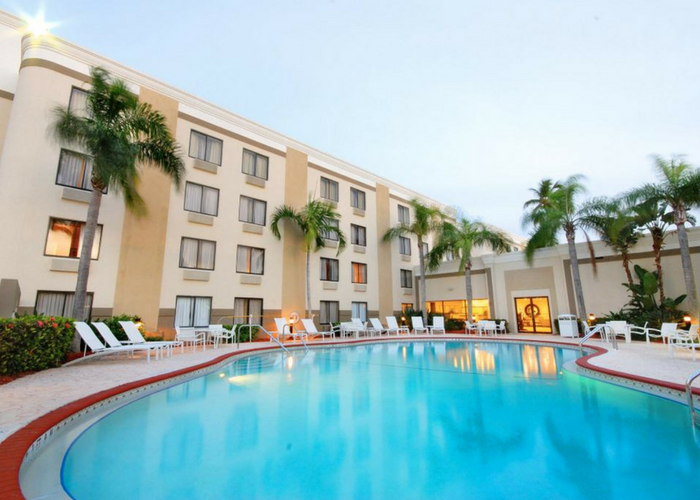 Just one mile from the Harborside Event Center and similarly close to JetBlue Park at Fenway South Hammond Stadium, this cheap hotel in Fort Myers is perfectly placed for sports fans. Free breakfast daily adds to the value. There’s also self-serve laundry and room in the lot to park buses and RVs. And you don’t have to leave Fido out of the action—this motel welcomes family pets, as does Dog Beach on Estero Island, about 30 minutes away. 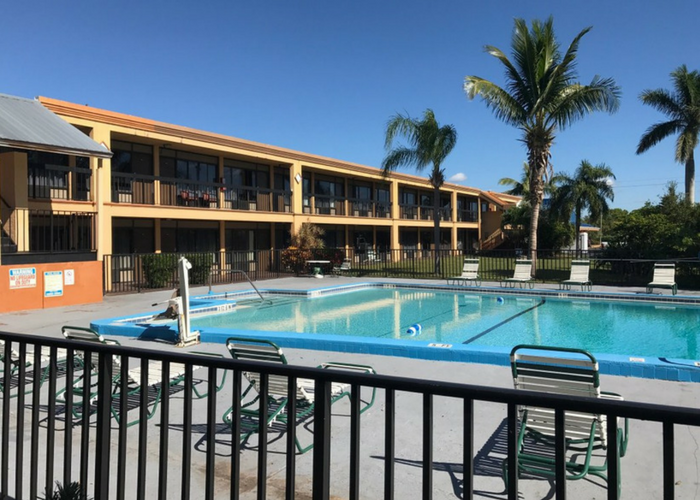 A true old Florida roadside motel, this serviceable facility is a choice option for anyone looking for a cheap hotel in Fort Myers while exploring the area’s wildlife refuges, beaches, and attractions. The motel offers in-room microwaves and refrigerators, Wi-Fi, flat-screen TVs, a clean outdoor pool, and a front desk that’s staffed 24/7. Amenities: Free Wi-Fi, in-room microwave and refrigerator, air conditioning, outdoor pool, 24-hour front desk, and flat-screen TVs.